I work broadly with the evolution and ecology of plant-herbivore interactions. I use such techniques as chemical analysis of plant phenotypes, field and laboratory experiments, and comparative biology to understand how plant defenses evolve, how they work, and how herbivores overcome them. The major themes of my research fall under the categories below. Humans have introduced plants outside of their ranges in almost all of the world’s ecosystems. In most cases, some native herbivores will consume or even rely on these non-native plants as food. We currently have a very poor understanding of the factors that allow some native herbivores to consume non-native plants, while other native herbivores avoid them. With a better understanding of the reasons why this plant-herbivore match is formed, we may be able to predict the herbivore associations with non-native plants before the plants are actually introduced. This would be very useful for pest management on new agricultural or horticultural crops. It would also help us understand why some introduced plants become aggressive weeds, while others are largely innocuous. My work uses introduced oak trees in cities and arboreta to understand the mechanisms of new herbivore-plant associations. I have found that trees with chemical and phenological (timing) traits that are similar to local natives tend to be colonized by local herbivores. I am also developing statistical methods for predicting novel plant-herbivore associations based on plant defensive theory as well as consumer “matching” applications such as product advertisement and internet dating. I test these techniques on a large foodweb of European butterflies and moths that links these herbivores to all of their native and non-native host plants. There is more diversity to oaks than just that iconic, lobed leaf. Way more diversity. Oak species are found on every continent in the Northern Hemisphere. They inhabit deserts, deciduous woodlands, chapparal, tropical forests, and rainy coastal areas. In each of these habitats, oaks encounter different herbivores and different abiotic challenges. In turn, oak leaves look very different from species to species. And herbivores notice some of these differences –in traits like tannins, leaf hairs, and the timing of leaf expansion. I am exploring the defensive traits of oak species and herbirove associations in order to understand how leaf defenses have evolved in the oak genus (Quercus). In collaboration with Andrew Hipp at the Morton Arboretum, I have assembled an estimate of how many of the oak species are related to on another using modern DNA techniques. And I am using this to look at what factors influence the evolution of oak defensive traits. We have historically thought about plants as playing a fairly passive role in their defense against herbivores, but more recently, we have found that plants are very active in evading their herbivores. For the last thirty years, we have known that plants induce toxicity (or other nasty traits) once herbivores start to feed on them. I have been exploring an even more complicated plant “behavior” in which plants can respond to cues from their neighbors. For instance, if a plant is being eaten by an herbivore, its neighbor may actually induce a defense to “prepare” for future herbivory. I have worked with plant-plant signaling in a variety of plant species including willows, Arabidopsis, and several grassland forbs. Another cunning defense that plants employ is the attraction of predators and parasites of their herbivores. For a long time, ecologists have known that plants produce sweet secretions to attract ants and attractive odors to alert parasitic wasps. Tarweed, a small flower in the sunflower family, attracts predators using a different technique. It is a very sticky plant (being covered in a resinous substance that is emitted from glandular hairs), and small insects that are just passing by often get stuck to it and die. Predatory insects, that are fairly large or use special walking techniques so as not to get stuck to the plant, are attracted to this carrion. 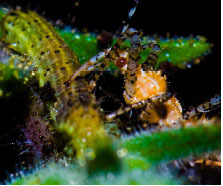 While they are there, they also consume some of the plant’s herbivores. One amazing behavior of oak trees is that they drop tons of acorns some years and very few in other years. Of itself, this might not seem so interesting, but most of the oak trees over very big geographic areas are synchronized in their acorn crop. So, if your oak tree in North Carolina has a lot of acorns, the same species of oak in New York is likely having a good year too. This has effects that work their way through all sorts of forest food webs –like limiting the populations of acorn-eaters such as deer, weevils, and many rodents. For the oak, this is a great benefit –acorns dropped in these boom or ‘mast’ years tend to escape being eaten by their herbivores. But we do not really know how oak trees pull off this huge act of synchronous acorn drop. I am working with Walt Koenig at Cornell University to figure out how oaks synchonize their acorn crop (or mast). Most hypotheses involve the effects of large-scale weather patterns on oak trees over broad geographic ranges. 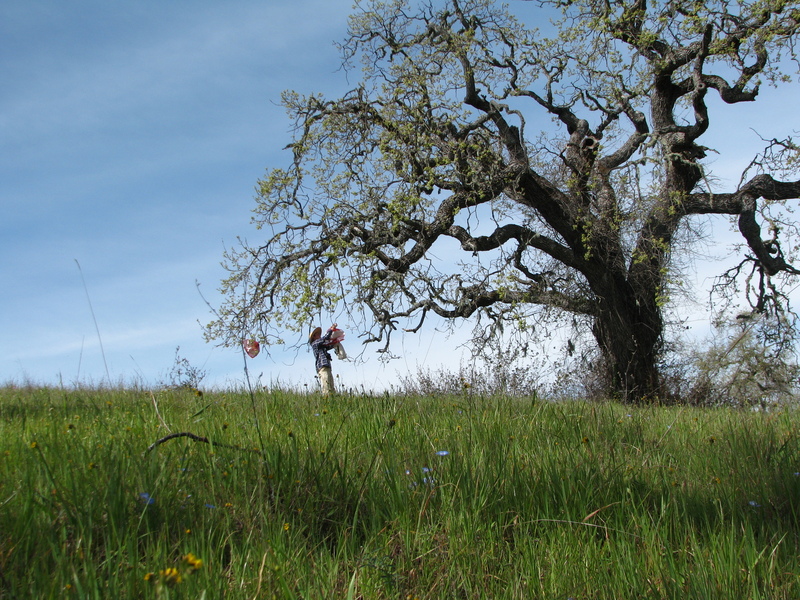 In order to address this mystery, I am armed with long-term datasets of acorn crops over broad regions as well as more detailed studies of oak flowering, oak nutrient fluxes, and acorn development on oak trees in California’s Central Coast. **please note that this is my personal website and is not related in any way to the U.S. Geological Survey. For an explanation of my work with the U.S. Geological Survey, please see my page on the USGS website here.